You don’t have to spend a lot to get a cool gift for your guy friends and family members. In fact, some of the coolest gifts you can get him are under $50. No matter what his likes and interests are, you can find the perfect gift for any occasion without breaking the bank. When camping, hiking, kayaking canoeing, and embarking on all manner of outdoor sports, having access to clean water is a constant concern. The LifeStraw Personal Water Purifier is the ideal personal water filtration solution. Don’t let him leave the house or lodge without it. Whether he’s on a camping trip or enjoying a celebration, he can sneak a drink with the rugged Stanley Classic Flask. It’s easy to store in pockets and camping packs, and features a wide mouth for easy pouring. If it’s a gift, you can make use of the engraving space on the bottom. For the card shark, illusionist, poker player, or anyone who enjoys the darker side of things, this deck of black playing cards features stunning artwork and a cool, mysterious vibe. You can never have too many guitar picks, and with the pick punch, you’ll never have to worry about running out. Use it to make real, useable guitar picks out of old hotel keys, credit cards, ID cards, and more. Itching to take a vacation? Throughout your travels, scratch out your location on the Scratch Map to mark the places you’ve been and learn some fun travel trivia along the way. The Grime Writer is a fun tool for those dirty, grimy surfaces that just beg to be written on. Fill the Grime Writer “pen” with cleaning solution, and go to town on the nearest dirty, dusty surface. For guys who love their tech toys, a batch of electronics cleaning putty is the best gift they can get. It cleans computers, keyboards, office equipment, and all sorts of electronics and gadgets. Take him back to his playful youth days with a soft football. A rubber grip and laces make it easy to catch and throw, and bright colors make the game more fun. It’s great for playing ball with the kids, or for when the guys want to feel like kids themselves. Men love their tools, and a tool that acts as many tools is a sure bet when it comes to gift-giving. The Crescent Odd Job Multi-Tool acts as a hefty steel hammer, soft-faced mallet, nail puller, screwdriver, and so much more. Give him the gift that lets him make a tangible version of the memories held in his iPhone, iPad, or iPod Touch. Mosaic is a unique app that lets him choose his favorite photos and make a stunning photo book that he can enjoy with his friends and loved ones. Campfire cologne gives him a little taste of the outdoors when he’s cooped up inside or stuck at the office. It burns similar to incense, releasing a wonderful, woodsy aroma that’ll bring him back to simpler times around the campfire. 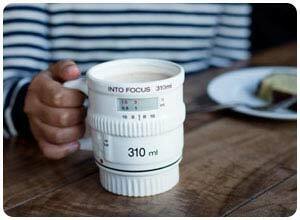 Pro and aspiring photographers will have even more of a reason to enjoy their morning coffee; the In Focus mug looks just like a camera lens. Even better: it’s dishwasher safe and has a cap to keep the coffee fresh. When guys begin an exercise regimen, many forget to include their hands, wrists, and fingers in an otherwise full-body workout. The Gripmaster Hand Exerciser is a perfect gift for guys who sit at the computer all day, or who otherwise use their hands a lot in their jobs and hobbies. Give him the gift of knowledge and experience, all compiled into this handy how-to book for men. There are tons of music platforms to keep track of: Spotify, YouTube, and 8tracks are just a few. Now, you can create personalized playlists using your favorite platforms and compile them on a Sharetape. Your playlists are in one place and ready to be shared with your friends. For the guy with all the latest tech toys, make sure his gadgets are always within reach. A stylish HEX Watch band keeps his iPod Nano protected and ready for use whenever the mood for some music strikes him. No one likes a warm, sweaty beer. Help him keep his favorite brew colder for longer with a set of innovative Hopside Down beer glasses. A magnetic wristband acts as a third hand when he’s busy doing home improvement projects and other items on his to-do list. It holds screws, nails, and small tools in place for quick and convenient access. On the best days, geeking out begins as soon as you wake up. Start the day with a hot shower and slather on some Geek Soap. Each soap is lovingly handmade by a fellow geek. Choose from several different but equally geeky soap options. A sleek metal hand warmer lasts up to 12 hours, making it ideal for hunting, camping, snowboarding, and any cold-weather activity. The iconic Abbey Road is the ultimate symbol of British music. This set of coasters pays homage to the legendary Abbey Road Studios, with images of vintage recording equipment on each of the 6 coasters. A bull head keyring figure mounts directly onto the wall, demanding to be noticed as he passes by on his way in or out the door. He’ll never lose his keys again. Forget the typical flowery scents and overly sweet fragrances of your average candle maker. The widely appealing Man Candles feature such universally loved scents as campfire, sawdust, fresh cut grass, homemade pizza, and more. For anyone with a passion for coffee and the culture that comes with it, the Secret Squirrel Cold Brew Coffee is a welcome gift that he can’t wait to try. It’ll be the best glass of iced coffee he’s ever had. These beverage glasses are the perfect gift for a man who likes his gin and tonics. The graphics playfully illustrate the correct proportion of gin to ice to tonic. And don’t forget the lime! Package together with all the ingredients to make a batch on the spot, and you have a winning gift! For the guy who likes a good workout, this inventive tool is great for providing pain relief, reducing inflammation, and improving muscle recovery time, circulation and mobility. Use the roller everywhere – neck, shoulders, knees, even the balls of the feet – for a better, more productive fitness session. Electronic gaming meets a decidedly offline pastime in this inventive puzzle mashup. 1,000 pieces form an image that is an homage to game nerds everywhere with a large collection of vintage game consoles, controllers, and cartridges. This is a great way to get gamers into the real world while still enjoying their hobby. Got a hairy man who needs some beard control? Show him that grizzly isn’t good with this two-piece beard-care kit that will take him from wooly to wow in no time. The all-natural jojoba and sweet almond oil, along with the shea butter balm, will keep those fuzzies smooth and in check. This amazing notebook takes a classic pen and paper experience and merges it perfectly with the digital age. This infinitely reusable “notebook” contains special pages that you write on just like paper, then use the app to scan it directly into your cloud-based programs. Wipe off the page and use it again! Make sure your rock star is never without a pick to play that blistering electronic riff. This “pick punch” will literally cut a 1” pick out of heavy plastic, like an old credit card or unused gym card. This is the perfect thoughtful and unique gift for any guitar player. Head for the hills with this creative caddy. Laser-cut from birch, two jagged mountain compartments with a line of evergreens in the front hold all of your office supplies including pens, paper, folders, and business cards. It would also be a perfect organizer for art supplies or a catch-all for mail. Give your adventurous beer drinker this innovative “caramelizer.” This stainless steel rod with beer tap handle goes into the fire – whether camping, using the backyard firepit, or even the fireplace on a chilly night – then when it’s hot, plunge it straight into the brew for a sweet, smoky flavor that adds a unique edge. Want to give your hockey fan a gift he will treasure? A practical and useful gift becomes a cherished artefact with this snowbrush made from actual retired hockey sticks. After they have done their duty on the ice scoring goals, they are ready to take care of the ice on your windshield. Now your beer drinker can have a personal microbrewery right in his own kitchen with this clever kit. It comes with everything he needs to brew a gallon of ale including 100% malt extract, specialty grains, high quality yeast, and, of course, aromatic hops sourced from Washington state. Keep your man smelling fine with these delightfully aromatic soaps from Man Bar. A trio of masculine scents, musk and sandalwood, sage and bergamot, and cardamom and juniper, together provide a cleanser, a refresher, and exfoliator. These big bars are not your average wimpy soaps! This set of five, high-quality cotton socks can be personalized for any occasion – add a classic monogram on the ankle for a sophisticated touch, write his full name across the toe, or include a birthday greeting for something that is truly personal. He’ll really know how special he is in these. Celebrate your shared city – where you met, or married, or where you call home now – with these etched cedar coasters. Each set of four maps out one quadrant of the town you choose. One is finished with the city’s name and established date for a pretty and practical gift. This ingenious idea will change the way you live! A bedside shelf that saves valuable space and holds up to 15 pounds will keep your water, phone, glasses, and nighttime reading close at hand. The beautiful bamboo tray easily fits most any bed, without tool -, just use the hidden clamps to tighten. What Do You Meme? The internet phenomenon is now a wacky game for grown-ups. Players try to match their best saying to a well-known online image to win. This game is sure to tell you more about your friends than you ever wanted to know. Some answers are definitely NSFW. It’s true what they say: you can fix anything with duct tape. The fun and instructive Ductigami book contains 18 projects to make using some ever-versatile duct tape. A hanger that’s made for men. It’s hand-bent and made from industrial grade rebar. It’s also been sealed and coated, protecting it from rust and corrosion. It’s enough to get even the manliest of men excited about hanging up clothes in his closet. For the wine lover, this unique gift helps him cool and chill his favorite wines without the mess and hassle of an ice bucket. Boring ice cubes are for boring drinks. Spice things up with this fun skull-shaped ice cube mold. The mold is the perfect size for a single ice “cube” that will chill a glass of whiskey. But it’s so unique, you’ll want to use it for all your drinks from now on. The John Lennon Letters compiles a lifetime of letters from the legendary singer and songwriter. It’s a thoughtful and meaningful gift for the musician, lyricist, or Beatles fan. A novelty grenade prop houses a secret 7-piece screwdriver set safely inside. It’s a perfect gift for new homeowners and on-the-go handymen. Whether he wears a tie by choice or by force (as outlined in his Employee Handbook), give him a clever way to add some of his own personality into an otherwise boring tie. The warm and sweet aroma of his favorite Kentucky bourbon is packed into a delicious handmade marshmallow treat. Help him master the art of fixing this with this exhaustive guide. It features 150 tips and tricks for making things last longer while saving money in the process. Grab your favorite photo of the two of you together, and give it a unique, stunning edge by turning it into an aluminum print. Vibrant colors and a subtle sleek shine turn a cherished memory into a lasting keepsake. A ruggedleather Mason Jar Travel Mug will help him enjoy his favorite beverage even more. It’s a wonderful gift that will become a treasured heirloom. In a world of fruity, flowery, and fresh linen scents, clear the air with Archer Air Superiority’s high-end masculine room sprays. Choose European Sports Car, Distillery, or Hunting Lodge. Vintage TeaWorks combines his two favorite loves: tea and wine. For the sophisticated, tea-peddling wine drinker, you can’t go wrong. Choose from several luxurious flavors to match his taste and personality. Some guys have a favorite beer they stick with, and others love trying new kinds of beer whenever they get the chance. For the latter, the Moleskin Beer Journal is a great way to make notes and record thoughts on all things related to the world of beer. Make his life simpler and way cooler with the Rinser Brush. It eliminates the need for disposable cups or glasses by the sink. Instead, the toothbrush doubles as a fountain for rinsing after brushing. Two shot glasses feature the “Nuclear” symbol, perhaps giving a warning about the dangers of his favorite shot drinks. This gift makes an excellent addition to his home bar, without making an equally- excellent dent in your wallet. Winston Churchill is the man every guy wants to emulate. Take a fascinating look at the former Prime Minister’s life, with a focus on the more personal aspects of his life outside the office, including his taste in books, cigars, wining and dining, and more. The Unbreakable Hatchet is perfect for campers, hikers, and all types of outdoor enthusiasts. It’s easy to carry, easy to use, and it handles better and faster than a traditional axe. Time to simplify. For the minimalist in your life, get rid of bulky, bulging wallets and introduce him to the Supr Slim Wallet. Its innovative elastic design makes it easy to carry and access all his credit cards, without the extra bulk and unneeded hassle of the traditional wallet. If the coffee doesn’t wake him up, the creature staring at him from the bottom of his mug certainly will. Choose from various creatures to brighten his day and surprise him with every cup of coffee. For hands-free illumination whenever he needs it, the Striker Magnetic LED Light Mine delivers. Create a freestanding 360-degree lightsource that he can be used for projects at home andfor repairs on the go. A ticket stub organizer lets him hold onto a little piece of some of his favorite trips and visits throughout his past. He can hold onto ticket stubs, programs, and flyers from ball games, concerts, museum exhibits, movies, and much more. There’s nothing more manly or cool than serving food from a thick slice of tree. This wood slice serving board looks striking on the table and it is something that you can make on your own as long as you can cut the wood. A combination of bacon and salt is all that’s needed to get most men salivating. They can sprinkle this on any food they’re eating and it will magically have the flavor of bacon on it. Great for soups, salads, meats, and more. If they love comic books in any way, shape, or form, these comic book coasters will be a big hit with them. Make their favorite superheroes if you know who they are. Superman, Batman, and X-Men are popular choices to go with. Keep his lips kissably soft and smooth all year long with this lemon butter lip balm. Rather than the balms you’d buy in a store, this one is made with all natural ingredients so you can feel good about giving him this. This unique wine glass holder goes right on top of the wine bottle, and let’s him carry four glasses and the bottle of wine all at once. It’s a cool gift that he can use when entertaining a small get together. Guys will love getting this hand scrub as a gift because it’s clearly labeled as manly. It will help bring their hands back to their normal state after they’ve gotten them extra dirty from working in the garage or around the home. One great gift for guys is this homemade shaving cream that’s infused with the wonderful and natural ingredients rosemary and mint. This will get his skin ready for a shave and help soothe it so he doesn’t get razor burn. Make him this magnetic wristband and he won’t drop screws, nuts, and washers all over the place when he’s doing projects around the home. It’s the sort of gift that he’ll thank you for again and again each time he uses it. With this mini wooden crate you’ll be able to fit his favorite beers in style. Perfect for the beer loving guy in your life. It’s a much better upgrade to the cardboard box most six packs come in and is a lot sturdier. Know someone still using an MP3 player or other media device for music? They will enjoy this custom leather case that is lightweight, protective, and fits in their pocket. You can customize the color and even print patterns right on the material. The recipient is sure to appreciate your thoughtfulness. If you’ve never tried hand-stamping metal before, check out this simple tutorial for your first project. It requires specialty tools and supplies, but the trip to the craft store will be worth it when you see these adorable bar tags. Once you get the hang of it, you will be stamping all over the place. Need a manly gift for your favorite beer drinker? Check out this clever idea for making rustic soap with beer. Yep, you heard that right. Believe it or not, it doesn’t smell like beer, but has a rich caramel scent with citrus notes. Your guy will love it. This gorgeous gift has it all – a beer caddy, beer bottles, and beer glasses. What more can a beer drinker ask for? Follow the simple woodworking plans to make your own clever caddy, then design stencils and etch a monogram on two pints. Top it all off with a couple bottles of his favorite brew. Make a batch of this amazing beard balm for your scruffy fella and he’ll be stylin’ in no time. And don’t forget the hair on his head. This makes a great styling gel all over! If you put it in a cute tin and attach a vintage label, you have a true gift-worthy DIY. All men deserve a cool gift on their special day. Fortunately, you can find some of the coolest gifts for guys without having to break the bank. No matter his age, job, hobbies, personality, or style, you can find the perfect guy-friendly gift for under $25.